After issuing a premier hockey set in 1954-55, Topps took two years to monitor the hockey market before releasing a second set. Evidently, the research they did said that the cards would sell better if they also included French translations on their backs, which weren't present in the first set. Once again, 1957-58 Topps Hockey is limited only to the players on America teams. The cards were also reduced to the 2 1/2 x 3 1/2 standard Topps adopted in 1957. 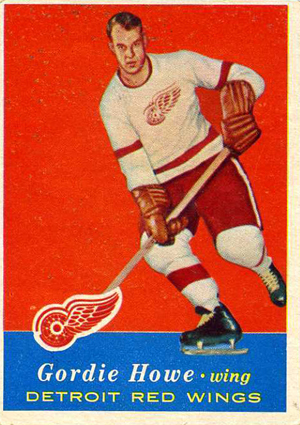 1957-58 Topps Hockey card fronts have a player picture superimposed over a solid-colored background. There are three background colors: red, yellow and blue. A differently-colored solid block below the player contains his name, position and team. A team logo covers both the background and the block. Card backs use red and blue ink that split the card into two parts. At the top left corner, a circle contains the card number. The player's name, team and position run across the top, followed by a line of stats from the previous season. The biographical information appears twice: in the blue area, it appears in English and the French translation is in the red area. To the right is a trivia question, with the English translation in blue ink and the French translation printed in red. There are 66 cards in the 1957-58 Topps Hockey set, with the four teams grouped together numerically. The Boston Bruins show up on cards #1-18, Chicago Blackhawks take cards #19-33, Detroit Red Wings are cards #34-50 and New York Rangers are on cards 51-66. Key rookies include Glenn Hall, Johnny Bucyk, Norm Ullman and Pierre Pilote.